The WRC hosts different events throughout the semester for members of the campus community to learn more and create connections. Check out what's happening! There are so many opportunities for campus community members to get involved this April - find an event that works for you. Help create a community of care! SCREAM Theater is an evidence-informed prevention program based on peer education improvisational theater. The group of trained actors is associated with the Office for Violence Prevention and Victim Assistance at Rutgers University. Student performers and peer educators use interactive skits to educate audiences on issues of interpersonal violence, specifically on sexual assault, domestic and dating violence, stalking, sexual harassment, and bullying. SCREAM Theater performances are written and envisioned by college students to ensure discussions are relevant. Organizers of the event, along with Rutgers VPVA, strive to create performance and participant spaces where everyone feels safe, supported, and valued. 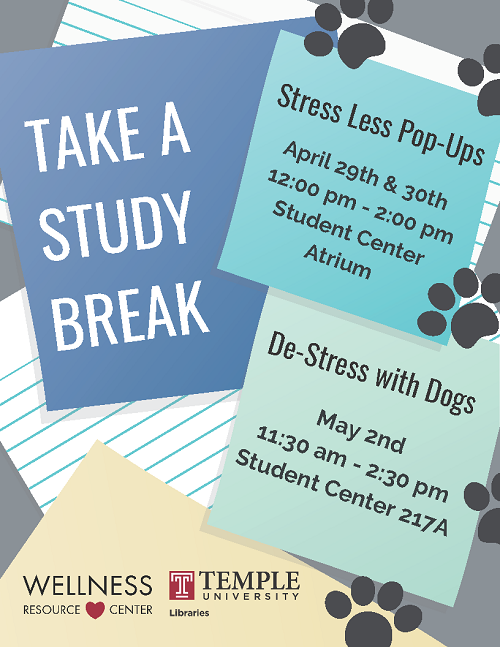 The WRC & Temple Libraries have partnered to offer some study breaks during finals! We'll also be offering an "Owl About Stress" session! Stay connected and learn more about upcoming events by following @BeWellTU on Twitter, Instagram, and Facebook!